Today is Day Five of Christie Wright Wild’s PB 14:14…what an amazing challenge. I hope you are all enjoying this look at the top ten elements in picture books. To see the others that have been posted today, please click on this link: http://christiewrightwild.blogspot.com/2015/02/day-5-papas-mechanical-fish-by-candace.html. Fairy tales were always a favorite with me when I was a child. These days, there is a new fairy tale in town – the fractured fairy tale. Some writers are quite gifted at taking an old story and turning it into something new and different. My choice for today’s PB 14:14 is a take-off on Goldilocks and the Three Bears and is very strong in the elements of plot and pacing. There’s Daddy Bear, Mommy Bear, and me. One morning, Mommy made porridge for breakfast, but it was too hot to eat. “Let’s all go out for a stoll in the park while it cools down,” said Daddy. So we did. What I love most about this story is how each facing page shows vignettes of Goldilocks and how her day is progressing while the Bear family goes about their business. This is such a clever way of controlling the pacing and developing the plot. Throughout this parallel adventure, we get a sense of excitement and apprehension – we know Goldilocks is going to be found out – but what will happen? Talk about a satisfying ending with a twist…see if you can get a copy…you will love it! It’s inspired me to try my hand at writing a fractured fairy tale. 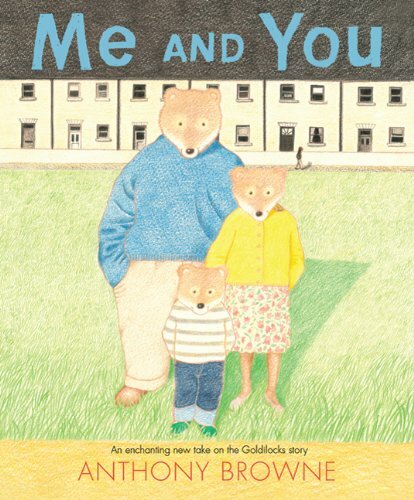 This entry was posted in Christie Wild's PB 14:14, Top Ten Elements in Picture Book Stories and tagged Anthony Browne, Fractured Fairy Tales, Me and You, Plot and Pacing by viviankirkfield. Bookmark the permalink. It’s amazing how many ways a single story can be twisted. I wonder how many fractured fairy tales have been done in the past 15 years. I’ve seen so many. Some of them I really like but, to be honest, I am starting to grow tired of them. What makes this one stand out from the rest, Vivian? I need more of a “hook”. This looks like a fun twisted (updated) tale. City. Well dressed bears. Civil looking. I’m curious now, and you’ve got me interested. Also, I find it hard to separate PLOT and PACING, as your focus indicates. They seem to always go together like…well, like porridge and butter. Oh! I do LOVE Anthony Browne! His pictures put more twist on the tale along with the story itself. He’s a genius!